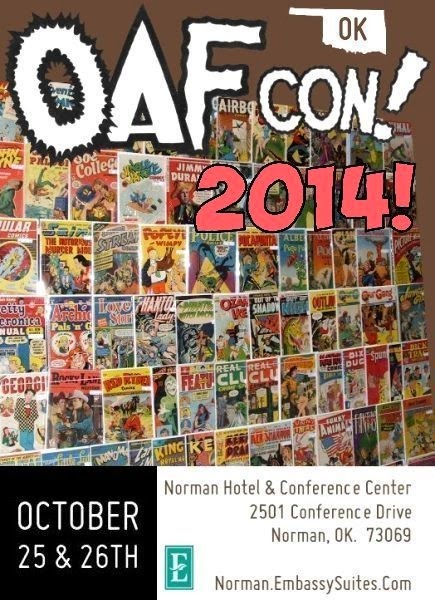 Here's a quick post to share the news that OAFCON is back! This is an event here where I live (Oklahoma) and it will be at the Embassy Suites in Norman, OK on October 25 and 26, 2014. Doors open at 10:00 am and it runs till 7:00 pm on Saturday, 6:00 pm on Sunday. Admission is only $5.00. This is a BIG Comic Book Convention that has been going on in Oklahoma FOREVER ( I remember going to one when I was a little kid, ha) and they always have some really great guests that show up. To check the guest list, and for more information, please be sure to visit their website, just CLICK HERE!